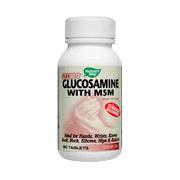 Glucosamine with MSM dietary supplement with Stomach Guard, is ideal for hands, wrists, knees, back, neck, elbows, hips and ankles. Double effectiveness combines clinically researched glucosamine sulfate with sulfur-rich MSM to provide powerful nutritional support for healthy joints by lubricating and nourishing damaged tissue and cartilage. Sodium Free Nature's Way FlexMax glucosamine sulfate is preferred by people concerned about high blood pressure because it is processed with potassium chloride rather than sodium chloride (table salt) as found in other brands. Non-Irritating/Stomach safe - the proprietary Stomach Guard technology utilizes plant fibers to form a protective gel around the tablet upon entering the digestive tract. This natural gel provides a cushioning effect and regulates the release of glucosamine, this shielding against potential stomach irritation. Nature's Way FlexMax can be comfortable taken at any time of the day, with or without a meal. Take two tablets two time daily. Glucosamine (as glucosamine sulfate potassium chloride), Methyl Sufonyl Methane (M.S.M). Stomach guard. Glucosamine & MSM is shipped in a discrete, unmarked package. Orders are processed immediately and usually take about 3 to 5 working days to be received. We do ask that you try it for 2 to 3 weeks to feel the full effects. Any information received is used only for order processing and shipping purposes. Your information, such as e-mail address, will never be disclosed to a third party.